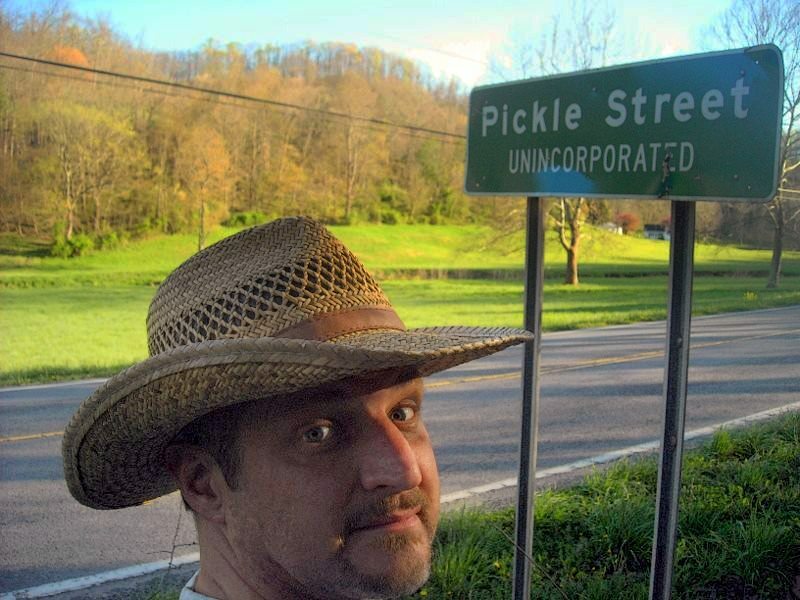 Editor David Sibray indulges in the tradition of having one’s photo taken at the Pickle Street sign in central W.Va.
Of all the odd community names one finds in West Virginia, Pickle Street may rank among the oddest. Why this hamlet on Leading Creek in Lewis County bears the name “pickle” is as much a mystery as is the term “street.” There is little street-like about scenic U.S. 119, which wanders the valley between Glenville and Weston. Several obscure theories as to why the community is so-named have been put forth, though none may ring true, and the name origin may remain a mystery. According to one source, the community may have been named for a muddy track located along the old dirt road that led through the community. According to this tale, wagons bearing supplies from Weston to Glenville would often mire in a particularly huge mud hole there in spring, when the weather is typically its wettest. Another origin was postulated by Maud Harris Eakle, of Fairmont, who lived in Pickle Street when she was a child. She claims the place was named after a jar of pickled beans which she broke over the head of a schoolmate who had “said things about my mother.” This according to the late Jim Comstock, who chronicled such tales. A fourth origin may be that Pickle had been a surname for an early settler. Pickles Fork, in nearby Braxton County, is the name of a small right-hand tributary of Salt Lick Fork of Little Kanawha River. Pickle Ridge, in Pendleton County, is a short ridge that rises to about 3,000 feet in elevation west of the South Branch of the Potomac. It’s also been said that “pickles” was another term for “whiskey,” and that the community might have been known as a source for libations. Perhaps some intrepid genealogist will be able to determine whether any Pickles ever lived in the little valley along Leading Creek. One of our contributing editors, Jennifer Smith, of Beckley, has suggested that Lewis County might be able to make hay out of staging a “West Virginia Pickle Festival” there.